The Pharmacy Council has said its investigations have revealed wanton abuse of codeine cough syrup by the youth in Ghana. Christian Trebi Quaio, the Regional head of the Council, told Luv News their findings indicate a combination of Codeine and Tramadol in some parts of Kumasi. According to him, 35 over-the-counter drug shops found to be selling the prescription drugs in the Ashanti Region have been referred to the head office in Accra to be sanctioned. A lot of Ghanaian and Nigerian youth have lately taken to abusing the drugs whose excessive consumption can cause organ failure and schizophrenia.”We know for such through our investigations in areas like Bantama that Codeine is being abused. It used to be Ephedrine which was wantonly abused…we don’t know what will pop up,” he told Erastus Asare Donkor, Friday. On Friday, four pharmaceutical companies were raided in Nigeria after a BBC investigation into the role of cough syrup containing codeine in an addiction epidemic. The BBC investigation showed the syrup being sold on the black market for young Nigerians to get high. The probe recorded a number of pharmaceutical employees selling the drug illegally. Prices of the syrup on the black market have shot up since the ban. 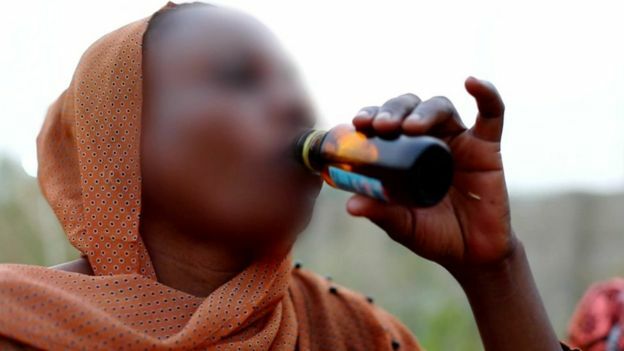 Officials estimate that about three million bottles of codeine syrup are being drunk a day in just two states, Kano and Jigawa. Until the codeine abuse made the headlines, Ghana has been battling the abuse of Tramadol among the youth. The Food and Drugs Authority (FDA) in April referred 21 over-the-counter chemical sellers to the Pharmacy Council for stocking and selling high doses of Tramadol. Nora Narkie Terlabi, the Ashanti Regional head of the FDA told Joy News, the exercise is to regulate the sale of the drug in the Ashanti Regional capital, Kumasi. According to the Regional boss of the Pharmacy Council, it is time society comes up with a concerted effort to fight the canker. “It is not a fight for one agency, we hope that all people will rope it and help with the fight,” he Mr Trebi Quaio said. Late Winter Storm Hits Central Illinois….